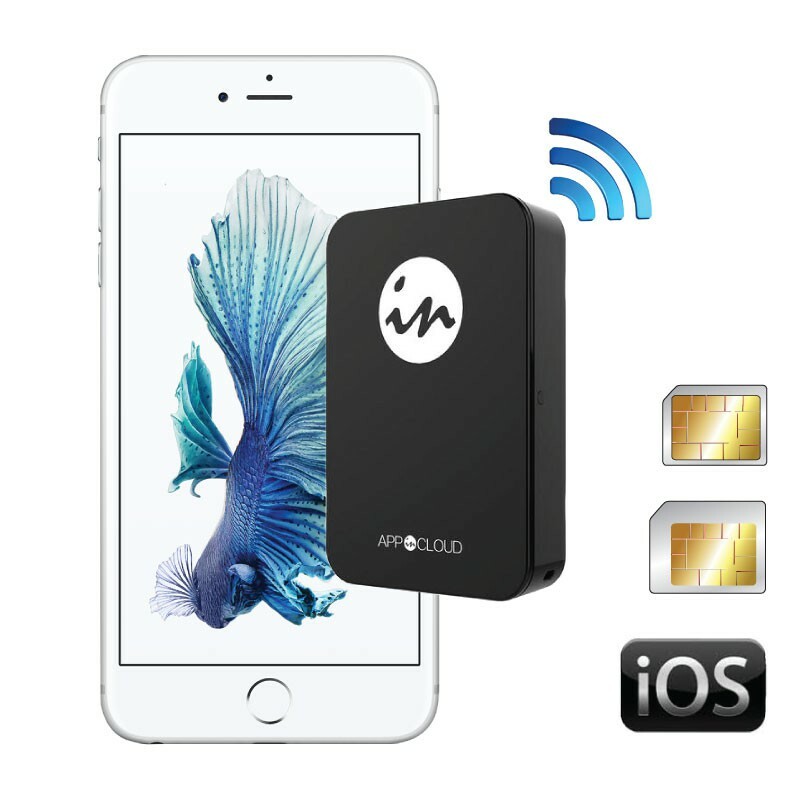 GoodTalk is a dual SIM GSM Bluetooth accessory, lightweight and compact, which transforms your Apple iPhone, iWatch, iPad and iPod Touch devices to add one extra SIM card and get more voice calls and sms. Your iPhone becomes a Dual SIM card phone. GoodTalk is a dual SIM adapter which allows to use 2 active SIM cards at the same time on your iPhone. This dualsim adapter transforms your iPhone into a Dual SIM simultaneous smartphone without jailbreak. You can make and receive calls, send and receive SMS messages with two SIM cards simultaneously without having to carry several mobile phones. You manage your calls and your messages on two active SIM cards from the screen of your iPhone and centralize all data of your SIM (phone book, SMS, call logs ...) on one phone. Your iPad becomes a smartphone. GoodTalk turns your iPad Wifi into mobile phone or your iPad Wi-Fi + Cellular into Dual SIM cell phone. You can make phone calls, send or receive SMS text messages on one or two active SIM cards simultaneously with your tablet. Your iWatch or iPod touch becomes a mobile phone. GoodTalk turns your iWatch and iPod Touch into cell phone to make and receive calls and SMS. The Bluetooth adapter GoodTalk is easy to use and is without jailbreak. With its simple and intuitive interface, you choose the SIM card to use right before a call or sending SMS. This accessory integrates an anti-loss function which alerts you when you're away from your iPhone. GoodTalk is also a camera remote shutter for your iPhone. The long-lasting battery of the GoodTalk dual SIM adapter is rechargeable by micro USB. Turn your iPhone 7, 7 Plus, 6, 6S, 6 Plus or 6S Plus, SE, iPhone 5, 5S, 4S into Dual SIM card phone. Turn your iPad into cell phone or Dual SIM smartphone. Turn your iWatch or iPod Touch into cell phone. Connects to your Apple device via Bluetooth within 10-15 meters. Triggers remotely your iPhone's camera. Small and lightweight, only 30 grams, it fits easily into a pocket or a bag. No jailbreak: Just download and install the app on your Apple system. Do I need to jailbreak my iDevice to use the bluetooth dual SIM active adapters ? No, the bluetooth Dual SIM card adapters don't require to jailbreak your Apple device. Can I receive calls and SMS simultaneously on both SIM cards with the bluetooth adapters ? Yes, the bluetooth adapters are dual SIM devices with simultaneous connection that allow you to use 2 active SIM cards at the same time on a single smartphone. Can I use all SIM cards sizes into the bluetooth systems ? The SIM slots size of these adapters is micro SIM format. It is possible to turn your nano SIM or mini SIM into micro SIM size by using our SIM accessories. Can I surf the web and make data via wifi with the bluetooth dual SIM active adapters ? Yes, you can use the wifi on your smartphone when the bluetooth adapter is connected. Can I surf the web and make data via 3G or 4G with the bluetooth adapters ? You keep using Internet and access 3G and 4G on your smartphone with the main SIM card located into your mobile phone. Can I choose incoming calls ringtone for the SIM card placed in the bluetooth adapter ? Yes, a selection of ringtones is proposed. Can I use another Bluetooth device simultaneously with the bluetooth dual SIM active adapter ? Yes, it is possible to connect at the same time a second bluetooth system (for example free car kit or headset) to your mobile phone. Yes, the app allows you to select the SIM you want to use for calling your contacts or sending messages. What is the Bluetooth's operating range ? The connection range is 10 - 15 meters. What is the battery life of the GoodTalk adapter ? The GoodTalk dual SIM has its own battery. The battery life is 4 hours of talk time and 60 hours of standby time. How to charge the bluetooth adapter ? Each adapter comes with a USB charging cable.